How has another month gone by? I almost missed the chance to tell you about the April Beauty Heroes Box! I haven’t tried a new mask in a while so it was a delight to have the excuse to try two (!) with this month’s box. Lilifox products are made by hand by founder Alexis Rose and her all-female team in Miami, and she is incredibly conscious about where she sources her ingredients from. In fact, this month’s box almost didn’t happen because Alexis only sources her honey from a single beekeeper all the way from a rainforest in Hawaii, and they weren’t sure if they’d have enough. Now, those are standards. Lilfox’s hero product is Jungle Glow, a cleanser, exfoliator and mask, all-in-one. The consistency is like a thick, solid honey that increases in viscosity as it warms up on your skin. I appreciated that it didn’t drip off my face, as some honey-based masks tend to do, and the scent is absolutely heavenly. Alexis happens to be a certified clinical aromatherapist, and really knows her stuff when it comes to essential oils – she only uses the best (they are GCMS tested). What I love about Jungle Glow is that it really does it all. I apply it like an exfoliator first, gently rubbing into my skin in a circular motion to loosen up any daily residue/pollutants or dead skin. Then I let it sit for about 15-20 minutes while I do something else (most likely that is using my breast pump, these days, haha). My skin comes out of this experience calm, moisturized, soft and clear. Even my fine lines seem like they’ve faded a little. I really love it. This month’s side kick product is Lilfox’s Cleopatra Milk and Honey Mask, which is a launch exclusive to Beauty Heroes. This is a dry mask that the user mixes with water, and the results are worth the extra 2 minutes of labor. Cleopatra seems to be the perfect balance of enzyme exfoliants, soothing clay and coconut milk, aromatic crushed rose petals and jasmine and brightening camu camu and baobab. This mask detoxifies, tones and boosts cell turnover. It was such a treat to try a brand that was new to me that makes such unique, effective products. As usual, this month’s box is a steal; it would normally retail for $163, and Beauty Heroes members will receive it for less than $40. Hurry, because April 20th is the last day to order this month’s box! 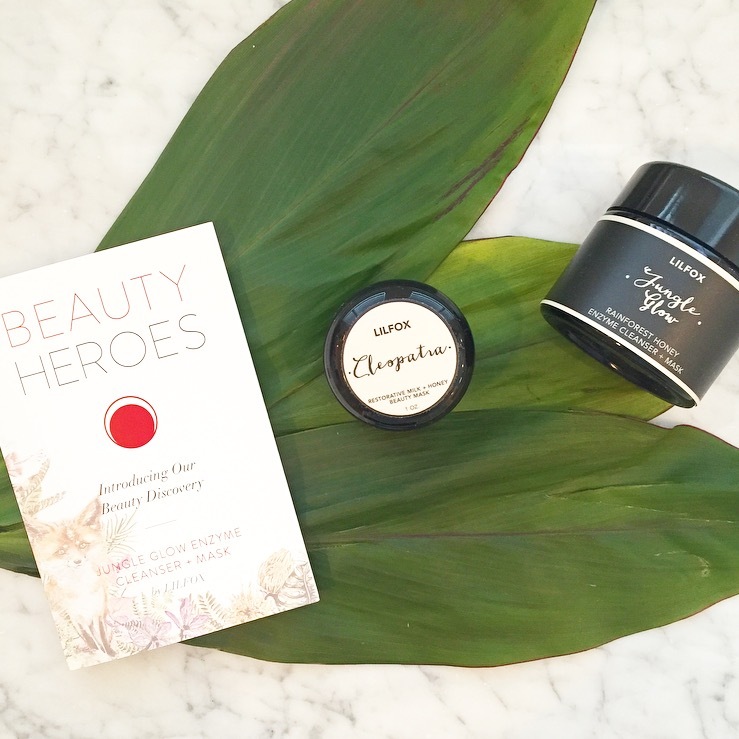 You can sign up for the April Beauty Heroes Box here. And, Beauty Heroes members get 15% off everything, every day at the Beauty Heroes Store. Hope you are enjoying spring weather, wherever you are!